This crow knew exactly what it wanted and stopped at nothing to get it. 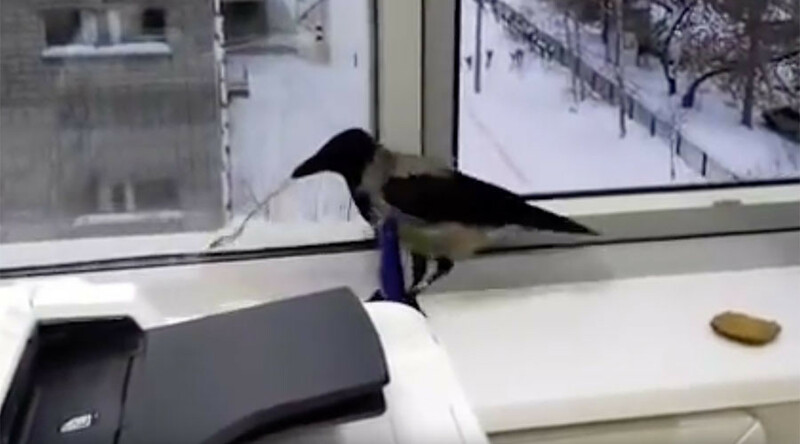 Watch this trending video showing how this smart bird outdid Russian-speaking office workers. The video starts as the feathery visitor comes entreating at an office window, only to be greeted by a young woman with a cookie who is amused at the crow hopping on the other side of the glass. “Oh look, he’s not afraid at all, he’s waiting” another woman’s voice can be heard saying out of view as the office workers collectively decide to open the window. They try to feed the bird some cookie crumbs, but, though never flitting, this “raven” shows no interest. Instead the crow makes an attempt to get inside, but the flustered office staff quickly shut the window. It should be said here, that in Russia there is a superstition that says a bird flying into a home brings bad luck. “He looks so smart,” the woman out of view says, “Maybe he was a human in a past life.” Open then they flung the shutter, letting the bird back in again. The crow knew exactly what it was after. Not a minute stopped or stayed he. Without hesitation the bird went straight for the teaspoon lying on the windowsill, deftly grabbed it, and that was their sign in parting. Once back outside, the crow took its time adjusting its grip on the spoon, as if mocking the humans watching helplessly from the other side of the window, before taking off with the shiny treasure in its beak. Crows and other birds of the corvidae family are known to be fascinated by shiny objects, but unlike the myth, they do not collect them in their nests. So chances are high that the bird let go of its possession pretty quickly after flying away. The spoon is probably lying on the ground right now, and shall be lifted – nevermore. Or maybe it sold it at a black crow market. What do we know?